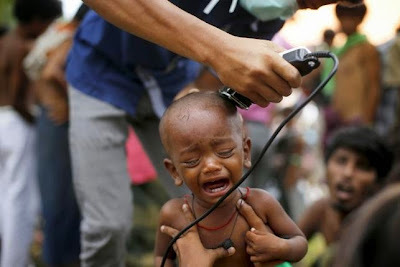 A Rohingya migrant child, who recently arrived in Indonesia by boat, cries as a volunteer cuts his hair inside a temporary compound for refugees in Aceh Timur regency, Indonesia's Aceh Province May 22, 2015. SITTWE, MYANMAR/YANGON -- The head of the Myanmar state from which thousands of Rohingya Muslims are fleeing denied that persecution had prompted the exodus after the United States called on the country to deal with its root causes. Many Rohingya have become prey to human traffickers on the journey south to Thailand, Malaysia and beyond as they flee what U.S. Deputy Secretary of State Antony Blinken said on Friday were "the desperate conditions they face in Rakhine State". Rakhine Chief Minister Maung Maung Ohn told Reuters after meeting United Nations officials on Friday: "I am disappointed by, and completely disagree and reject such unfounded allegations by the United States." "This (migration) is human trafficking, not (due to) political or religious discrimination at all." Blinken, who was visiting Myanmar on Thursday and Friday, told Myanmar's leaders they needed to address discrimination and violence against the minority Rohingya. The majority of the more than 3,000 migrants who have landed on Malaysian and Indonesian shores this month were Rohingya Muslims, Blinken had told reporters. The crisis flared in Southeast Asia after a Thai crackdown on human trafficking led criminals to abandon overloaded boats in the Bay of Bengal and the Andaman Sea rather than risk trying to smuggle or traffic them through preferred routes in Thailand. The United Nations refugee agency UNHCR estimated on Friday that some 3,500 migrants are still stranded on boats with dwindling supplies, and repeated its appeal for the region's governments to rescue them. Myanmar's navy discovered two Thai trafficking boats off the coast of Rakhine on Thursday, one carrying migrants and the other empty, the state government said in a statement on Friday. "One is loaded with around 200 Bengali people," it said, using the government term for illegal migrants from Bangladesh. "The people on the boat were all from Bangladesh," said Rakhine State government executive secretary Tin Maung Swe. "We will deport them." Maung Maung Ohn said he would take a U.N. group to meet the migrants to show they were victims of trafficking, not persecution. Myanmar has faced international criticism for not doing enough to help those at sea or stem the flow of migrants. Migrant boats are often a mix of people from Bangladesh seeking to escape poverty at home as well as Rohingya. Most of Myanmar's 1.1 million Rohingya are stateless and live in apartheid-like conditions in the state. Almost 140,000 were displaced in deadly clashes with majority Buddhists in Rakhine in 2012. They are denied citizenship and have long complained of state-sanctioned discrimination. Myanmar denies discriminating against the group and has said it is not the source of the problem. It does not recognize the Rohingya as an ethnic minority, and instead classifies the group as Bengalis. Most Rohingya reject the term and many have lived in Rakhine for generations. Myanmar military chief General Min Aung Hlaing cast doubt on the origin of many of the refugees in comments carried in Myanmar's state media on Friday. He "hinted that most victims are expected to assume themselves to be Rohingya from Myanmar in the hope of receiving assistance from UNHCR" at a meeting with Blinken on Thursday, the state-backed Global New Light of Myanmar newspaper reported. "He stressed the need to investigate their country of origin rather than to accuse a country," the newspaper said. Scores of Rohingya are paying off people smugglers and returning to the squalid camps they used to live in after being held for months on overcrowded ships off the coast of Myanmar. Malaysian Prime Minister Najib Razak on Thursday pledged assistance and ordered the navy to rescue thousands adrift at sea, and a Thai official said Myanmar had agreed to attend an emergency conference on the crisis on May 29. Malaysia and Indonesia have said they would allow the thousands still at sea to come ashore temporarily, but Thailand has said it would not follow suit.